We interviewed Adam Avery to gather his thoughts on how to store beer, what to expect from aged bottles, and the best ways to enjoy the experience of cellaring craft beer. Maybe you’ve been inspired to start your own beer cellar so that at some point in the future you can open up some special beers and share them with friends. Adam Avery, president and brewmaster of Avery Brewing, has been cellaring and aging his own beers, as well as sampling extensive vintages of other brewers’ beers, for decades. Craft Beer & Brewing Magazine® interviewed Avery for our premiere issue (Spring 2014) to gather his thoughts on how to store beer, what to expect from aged bottles, and the best ways to enjoy the experience of cellaring craft beer. 1. Choose the right temperature. For me personally, I like to keep my beer cold. I think that creates the best opportunity to oxidize in the “right” way and not in an accelerated way. All my beer (sour and non-sour) is stored in the 40°–45°F (4°–7°C) range. There is some fluctuation—never warmer than 45°F (7°C) and never colder than 38°F (3°C). I tell people to put it in the coolest spot in your house or buy an extra refrigerator and do it in a refrigerator. We don’t use corks, and you don’t have to lay the bottles down because of the kind of cap that’s on there. 3. Know what you can get, and what you can’t, from flavor. We don’t pasteurize our sours after bottling, so they can potentially continue to develop in the bottle. However, after a year or two in a barrel, I don’t know how much more active the bugs will be. Certainly, there’s an opportunity for them to still do something, but they’re typically living in these barrels between 60° and 72°F (16° and 22°C) where we’re promoting the growth of the organisms, and over that time the bugs do pretty much most of what they’ll do. If it’s a beer with fruit or barrel character in it, you can definitely see some maturation of flavors over time. But for me, a straight sour doesn’t change tremendously. Having said that, interesting things can develop that we haven’t planned. If you go back to the first barrel-series beer we packaged—Brabant—it wasn’t necessarily a sour beer, and we didn’t intentionally dose any bugs into it. It was designed as a 100 percent Brett beer [that is, one brewed with Brettanomyces yeast]. But there’s definitely something at work there. There’s definitely an acidity that has started to come through, a kind of sharpening of flavors. That beer has been in the bottles for several years, and it continues to develop. 4. Don’t cellar a beer without drinking one now. I tell people, if you have the means and you love a beer and think it’s going to be good for cellaring, buy a case. Drink one bottle. Then put the case away. Every six months, drink a bottle. Do you like it better? Or is it the same? If it starts declining, drink it fast! Typically, I don’t think they come back—it’s hard to say that a beer that goes down a certain path is ever going to reverse a trend and become better, although it could. You might like something that happens to it. It’s so subjective. But you have to know where you start to appreciate where it goes. 5. Age doesn’t generally create new flavors, but it lets some flavors fade, allowing other flavors to become more prominent. Take Old Jubilation, for instance. It’s pretty roasty and big, kind of old-aleish. But if you put two to three years of age on it, there is this chocolate quality that comes out. Is that the oxidative process that’s creating the chocolate? I suspect the chocolate flavor has always been in there, but was overpowered by the specialty roasts that we use in the beer, and time takes the edge off that roast flavor, allowing the chocolate to emerge. The Czar is similar. [ED NOTE: Since this article first appeared, production of The Czar has been discontinued.] We designed it as a Russian imperial stout with more toffee than coffee, and all the specialty malts we used oxidize really well to enhance those flavors, so it becomes more like a candy bar every year. It’s kind of aggressive when it’s fresh, but that black malt and any kind of roasted flavors fade pretty quickly, and the candy bar starts coming through. It’s not necessarily sweeter from a chemical point of view, but the perceived bitterness and astringency of the beer dissipate and therefore, it becomes “sweeter” in flavor. I think that sweetness was there originally, but after aging, it doesn’t have as much competition on your palate, so it comes through. When you have a beer that’s right out of the gate, typically it has peaks and valleys. That’s what I like in my beers. Age tends to level out those peaks and valleys. Some beers, it works and some beers, it doesn’t. 6. Brett beers tend to “clean up” when aged in the bottle. In Brett beers, phenol and ester production survives a lot longer. For example, in The Reverend, those flavors can last a lot longer than in Hog Heaven, where we use a standard ale yeast and get a “cleaner” fermentation. On some of the barrel beers where you have Brett involved, lots of funky things can happen. It can definitely change. But usually we have them in the barrel long enough at the right temperature so most of that activity is done [before bottling]. I think that usually, Brett beers in a bottle “clean up” so you get less of that barnyard quality. Take for example, Ross’s’s Melange, which has been in a bottle less than a year. It was fairly Bretty when we bottled it, and now it’s really come down and it’s a much cleaner smelling beer. Brabant was the same way. It was a 100 percent Brett beer. Dépuceleuse was also a 100 percent Brett beer. The same thing happened to that. It was very aggressively Bretted, but with time a lot of those flavors dissipate, which some people find they like, while others prefer a super Brett-bomb. One of the most interesting verticals I’ve done was in Belgium—a fourteen-year vertical for Orval. It was amazing how well the hops stayed with the beer. I couldn’t believe how well-made the beer was and how it could last that long. I’m not exactly sure what made the difference—I think it was just the Belgian magic. They dose Brett into the bottle and re-prime with sugar so there’s enough for the Brett to work on. I think there’s something to be said for that—the longevity of the Brett in that bottle. 7. Big beers age best. The coolest part about cellaring beer is that you don’t know. There are chemical processes going on that could be figured out, but nobody is figuring them out because there’s very little money to be made in it. It all comes down to your palate, and that’s what makes it fun for me. One beer tastes like hell to somebody, and to another person it’s the best beer they ever drank. That’s what I love about beer in general or big beers, but also in cellaring. You can’t just say, “I’m going to age this beer for ten years and I know it will be great.” You don’t know. People ask me, “What should I do with this beer?” I don’t know what you should do with that beer. Do you like it right now? Do you think it’s the best beer you’ve ever had? If so, you should probably drink it right now. Otherwise, you’re just rolling the dice. But once you start drinking a lot of beer, you can start looking at fresh beers and know that there are some flavors in there that you’ll like a year or two or three from now. Or maybe there are reasons you don’t love the beer, but you think a couple of years from now it might get better. Then you might cellar it. I would go on record to say that with some age, even a year or less, there will be a melding of flavors. Some beers may have too many peaks and valleys [for your taste] at the start and once you get some consolidation of flavors you get a beer you enjoy more. We’ve had our sensory lab for a few years now. It’s weird to see how people on our staff taste different things or don’t taste different things—because everyone has a hole in [his/her] palate. There are very few “super tasters.” We had Bill Simpson, world-renowned for sensory development, come in and train fifteen of our people to become “super tasters.” They went through an intensive two-week period where they did nothing but taste spiked beers, taste our beers, taste other breweries’ beers spiked, taste all these things. He found out what everybody is good at and what everybody is bad at. It’s really good for us, because everyone tastes a bit differently. There can be better vintages than others. For instance, I had a 2007 and a 2008 The Czar six months ago. The 2007 was far superior to the 2008. But you go back to the brew logs and everything was pretty much the same. For some reason, that vintage was better—at least to me it was. Of course, I was sitting at a table with some people who thought the 2008 was better. Again, there are no answers. There’s only a conversation. And that’s the best part about cellaring beers—you can sit down and talk about beer. There’s only one thing better than drinking beer and that’s talking with friends about beer while drinking it. 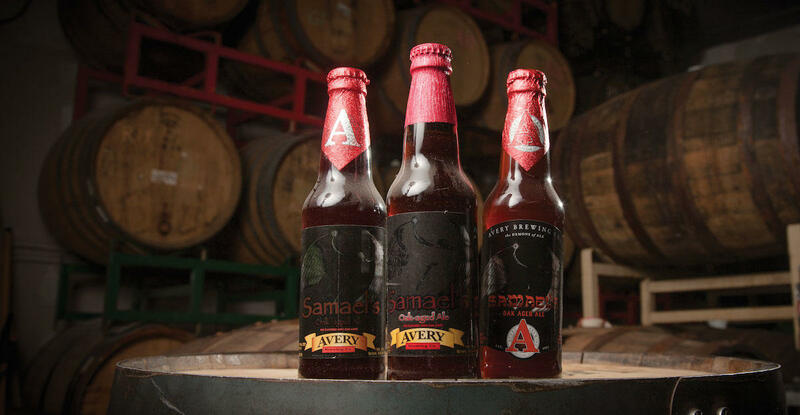 What really happens to a big barleywine, such as Avery’s Samael’s Ale, as it ages? The Craft Beer & Brewing Magazine® tasting panel tackled that question in January 2014 with three vintages—2005, 2007, and 2013—and it brought into focus just how age smooths out those “peaks and valleys” in a beer. Each taster had a different preference for favorite vintage, which we’ve noted. This beer was only a few months old and exhibited a sharper taste with heavier carbonation (as expected) but also strong oak and vanilla flavors, as well as a hint of coconut, that was not evident in the others. Tasters described it as having strong notes of toffee and tobacco, with a stronger hop character. The tasting panel found this beer to be a compelling mix of the best of the 2013 bottle with the mellowed characteristics of the 2005. At six years old, it retained a surprising amount of carbonation, but the bitterness of the fresh beer had faded significantly, allowing a sweet maltiness to come forward. Some tasters remarked on how little this nine-year-old beer had oxidized. The oak and vanilla were far less prominent, but the sweetness had developed to a level that some felt was cloying. However, the alcohol heat had dissipated, and the beer had rounded out into an almost dessert-wine experience. Get dozens of beer reviews and keep up with the latest trends in brewing and craft beer with a subscription to Craft Beer & Brewing Magazine®. Subscribe today! Only time will tell, but these 4 modern barleywines are currently your best bet for cellaring.